EX Raids are special, invitation-only events in Pokémon GO. They take place weekly with invitations distributed the week prior. EX Raids are pretty much identical to a normal Raid Battle but with the exception of needing to be invited. You can get an invitation in two ways: by winning a Raid Battle at eligible EX Raid Gym locations or by getting invited by friend with a high Friendship level. (These methods are detailed below.) The invitation will contain a time, a date, and the Gym at which the EX Raid will be hosted. Left: An EX Raid Eligible Gym, Right: An EX Raid invitation. There are two ways to get an invitation to an EX Raid. Take note, winning a Raid Battle alone does not guarantee an invitation. 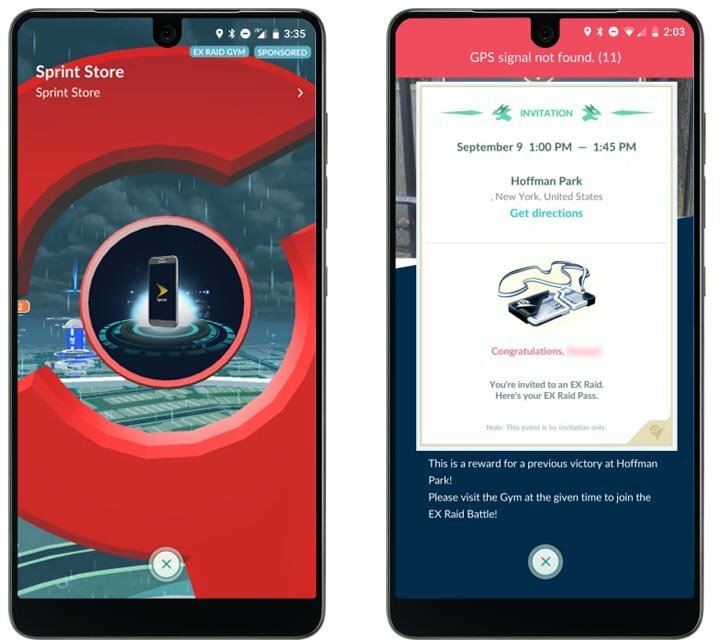 Trainers who have a higher-level badge at a Gym and greater participation in Raid Battles are more likely to receive an EX Raid Battle invitation. If you’re down on your luck or just too busy, the second way is to get invited by an Ultra or Best Friend in-game. Trainers who earn an invitation have the option to share an EX Raid Pass to bring along one friend. They will get an identical invitation with the same time, data, and location. Am I guaranteed an EX Raid invite if I win a raid? No, you gain a chance of obtaining one but there are ways to increase your chances. There are also other factors to consider. If a Gym is hosting a scheduled EX Raid, it cannot host one the following week. You will need to consult other community members or take time to get an idea of what gyms are eligible in a given week. The blue tags do not update to reflect weekly eligibility. How can I increase my chances of getting an EX Raid invitation? There are two things you can do to increase your chances. First is to raise your Gym badge level at a particular gym. Trainers with higher Gym Badge tier have a better chance of getting invited. Second is to Raid at more EX Raid Gyms. Winning at more locations gives you a chance to get an invitation to one of the locations. How many EX Raid invitations can I get per week? You can only get invited to one EX Raid by the system a week. But you can get invited by friends to attend additional EX Raids. So you could do 2 or more EX Raids in a week. eg. You receive an EX Raid invitation for yourself at 3 PM. Your friend gets an invitation for another location at 1 PM. He/She can invite you to that Raid and you can complete both. That’s 2 completed EX Raids. But how do you do more than 2? You simply get invited again to another location. If another friend has another EX Raid at another unique location at 3 PM, they can invite you to that one as well. You just have to make it there before it’s over. EX Raids have a 45-minute window. Keep in mind you can only hold one EX Raid Invite from a friend at any given time. If you plan on completing multiple EX Raids, you should get invited in the order of the scheduled times. Another pitfall to be mindful of is you cannot sent an invite to a friend once the EX Raid begins so do that in advance. When do EX Raid invitations go out? EX Raid invitations usually go out before the next scheduled EX Raid. eg. An EX Raid is scheduled on Friday, the invitations for next week might be Thursday. How do I send/share an EX Raid invitation to/with a friend? At the bottom of your invitation, there is an option to “Invite”. After tapping on that, you will be prompted to invite an Ultra or Best Friend to the same EX Raid. They’ll get a request and can ‘Accept’ or ‘Reject’ your invitation. It’s best to consult with them beforehand as you only get one chance to invite someone. If they reject your invitation, you won’t be able to invite another person.